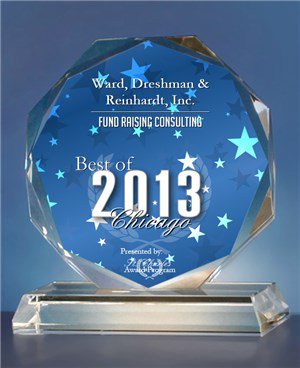 Chicago, IL -- Ward, Dreshman & Reinhardt, Inc. has been selected for the 2013 Best of Chicago Award in the Fund Raising Consulting category by the Chicago Award Program. Ward, Dreshman & Reinhardt, Inc. specializes in providing full-time, on-site capital campaign consulting for non-profit organizations. As the country’s oldest fundraising firm, WD&R revolutionized the way fundraising was done by introducing a short-term, resident-consultant approach that has proved to be very successful throughout its 100 year history. With its focus on fundraising for non-profit organizations, WD&R has been able to provide a much needed service that has been beneficial to many local communities. The Chicago Award Program is an annual awards program honoring the achievements and accomplishments of local businesses throughout the Chicago area. Recognition is given to those companies that have shown the ability to use their best practices and implemented programs to generate competitive advantages and long-term value. Various sources of information were gathered and analyzed to choose the winners in each category. The 2013 Chicago Award Program focuses on quality, not quantity. Winners are determined based on the information gathered both internally by the Chicago Award Program and data provided by third parties. For additional information regarding Ward, Dreshman & Reinhardt and the services they provide, please contact Erin West at 1-888-830-0533 or go to www.wdrincorp.com.